When you subscribe to RowShare Business, a new tab is added to your My RowShare page. On this tab, click on RowShare Business settings below the name you chose. Similarly to My RowShare, RowShare Business Settings consists of several tabs. Your members with elevated privileges will see some or all of these tabs. This is where you define the appearance and security of your RowShare Business subscription. This tab is accessible only to members with the Administrator role. Description: Add a brief description that members will see when they access RowShare Business. Allow External Access: This allows your RowShare Business members (the users you pay for) to open their tables to external users (anyone). If you allow this, your users will have a similar “Allow External Access” option in each of their tables, to decide table by table if it should be shared externally. By default, this option is enabled so that any of your tables can be accessed by users outside of your subscription. At any time, check this option to instantly limit access to your registered members only. A table can be accessed outside your own users only if this option is active both at the table and the subscription levels. Hierarchical Access Rights: This option, enabled by default, lets managers see and edit anything their team can see or edit, on top of their personal permissions. This is a great way to configure a table letting each member see only his rows, and managers will automatically see their rows as well as all the rows owned by their team. This works only if you define managers in the Members tab (see below). 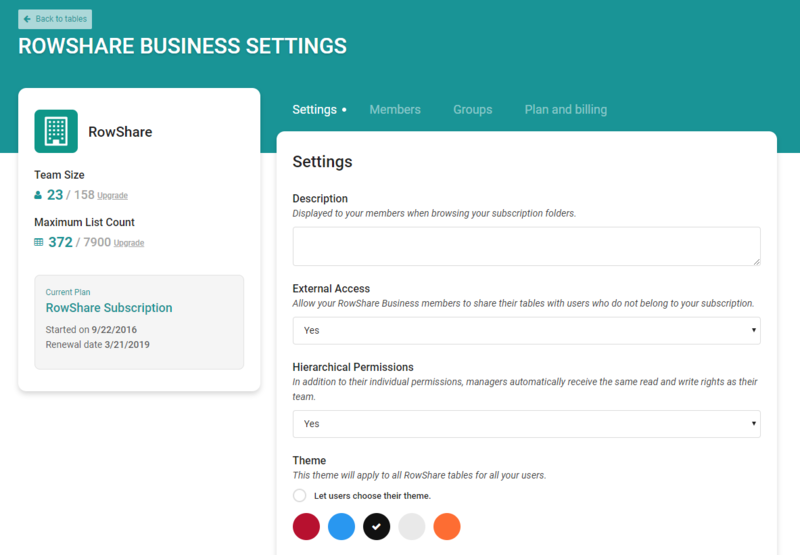 Theme: Select a theme color for all RowShare Business tables. This will override your members preferences. If you don’t care, leave the default option: users will keep the standard themes (red or blue only). This is where you invite members, and edit their attributes as explained below. Name: Regardless of the name users chose when they create their RowShare account, you define how they will be identified within RowShare Business. Email: This is the unique identifier of each member. Once invited, they have to connect to RowShare with the same email. Otherwise they won’t be able to access RowShare Business. Manager: You can optionally define a manager for each member. By defining the managers, you enable the Hierarchical rights (see the Settings paragraph in this page), and let people give access rights to teams. A team is a manager and his reports. Groups: Groups of members can have common access rights. A member can be part of as many groups as needed. See the Groups paragraph in this page for more information. You can activate and deactivate members as needed. Deactivating a member removes his access to RowShare Business. You do not pay for inactive users. Security officer: Gives access to the Members and Groups tabs of RowShare Business settings. Billing manager: Gives access to the Plan and Billing tab of RowShare Business settings. Universal owner: Gives access to all tables in the subscription with the same rights as the table owners. Administrators have all these rights combined. The user who creates a RowShare Business subscription is Administrator by default. There is a special role that needs more explanation: Read-Only. Obviously, they can't write! Regardless of the access rights set on a table, their access to the subscription tables is always read-only. These users are free and unlimited! Every RowShare Business subscription, even with only 1 user, comes with unlimited read-only users. 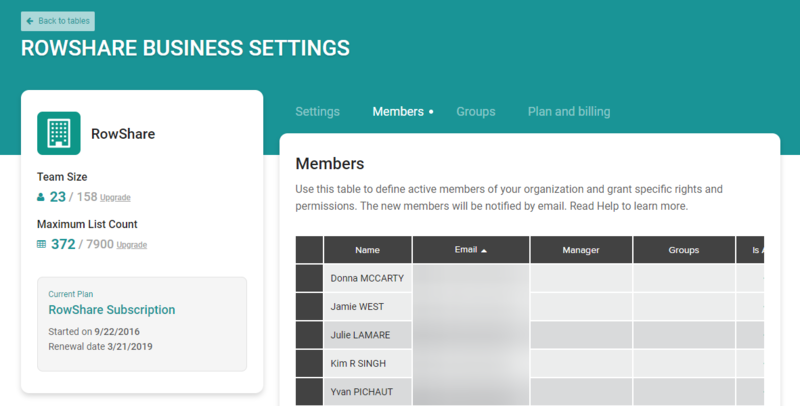 Groups simplify the management of folders and tables access rights.You can create groups as needed, such as Management, Marketing, Finance, HR, etc. If you would like to further refine your groups, create subgroups. Members can be assigned to groups in the Members tab, and there is no limit to the number of members that can be grouped. This last tab is covered in a separate help page.